Mercedes-Benz ended the 20th Century with new initiatives and strong partners that gave its motor sports program an unprecedented scope. Once chiefly European, Formula One racing had become a sport for the world. Mercedes' CART involvement from 1994 through 2000 far surpassed any racing effort the company had ever made in North America, culminating in the manufacturers' championship in 1997. With the help of AMG, Mercedes-Benz committed itself boldly to an exciting new multi-national series for GT cars. In an increasingly global industry, Mercedes-Benz was determined to have a global impact. This globalization accelerated under the leadership of the chief of Daimler-Benz, Jurgen E. Schrempp. In May 1995 Edzard Reuter was replaced as chairman of the group's management committee by Schrempp, who since 1989 had been running its Deutsche Aerospace unit. Jurgen Schrempp was no stranger to the automotive side of the business, having run subsidiaries in South Africa and the United States and also having led the Mercedes-Benz truck operations. 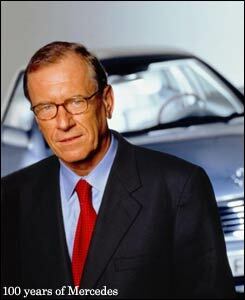 On 1 April 1997, Daimler-Benz implemented a Schrempp initiative. It eliminated a separate board and corporate status for Mercedes-Benz AG, which had been broken out as a separate company by Edzard Reuter. Its two divisions, passenger cars and commercial vehicles, were folded back into the mother company. A casualty of this restructuring was the head of Mercedes-Benz, Helmut Werner, whose vision of progress through partnerships had facilitated the creation of his company's new wave of motor sports programs. Subsequently Schrempp engineered Daimler's merger with Chrysler and his company's investments in both Mitsubishi and Hyundai. "Mr. Schrempp found ways of making us aware that he was interested in motor racing," Ilmor's Paul Morgan recalled. Since 1995 the British firm Ilmor had been a key partner of Daimler-Benz in the making of engines for both CART and Formula One. Daimler took a 25 percent shareholding in Ilmor. "At first he held back, but as soon as Daimler-Benz was officially involved he started coming to the races." In December 1997, Schrempp brought most of the Daimler management board members to Ilmor to have a look at their remarkable daughter company. They spent a morning in Brixworth touring the six main facilities, including the new engineering building with its extensive computer-aided design equipment. In their discussions Jurgen Schrempp left no doubt about the objectives he saw for Ilmor. "He's very clear in his messages," recalled Mario Illien. In the afternoon the delegation called on McLaren in Woking before flying back to Stuttgart. "I have really enjoyed these years with Mercedes," reflected Illien. "The great thing about the relationship is that they are tremendous in giving us help when we need it and leaving us alone when we want to be. When things go well that's easy but when they don't, it's not. They were always one hundred percent behind the program. They gave us the confidence that we could do the job." the death of Werner Niefer and the arrival and departure of Helmut Werner. An authentic survivor, Jurgen Hubbert was always willing to support the company's motor sports participation when it was not against its declared policy. Stuttgarter Hubbert had watched the racing on the old Solitude circuit near his home town in the 1960s. But his importance to the Mercedes-Benz competition effort was that he was not a racing enthusiast. 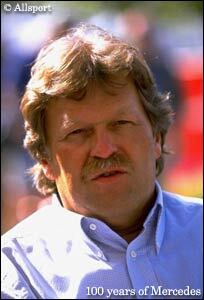 "He was never a 'fan'," said Mercedes racing director Norbert Haug about his boss, Hubbert. "He saw it as a marketing tool, as a means of presenting the brand. Thus motor sports never became a 'toy' of the management." Rather, it was entered, in the 1990s, as part of a planned marketing strategy. "We were all convinced that we could do something for the brand with motor sports," added Haug. "We thought we could. And our motor sports have had a big impact, especially among the young." In 1997, for example, the McLaren-Mercedes was featured on screen for more than 20 of the 244 Formula 1 television hours broadcast in Germany. In the same year the CLK-GTR was the on-screen star for 9 of 60 hours broadcast. In the PPG CART series an average of 140,000 spectators at each race saw Mercedes-Benz on its way to an engine manufacturers' championship. These successes were all achieved with the partnership concept introduced under Helmut Werner. "We have adapted our thinking to the times," explained Norbert Haug. "We don't have to make all the racing pistons and rods in Unterturkheim. We had to go to smaller independent units; this has been the form for this decade. This concept may have come from a time when we were poorer," Haug admitted, "but it has also shown that it can produce results. The results speak for the partnership idea: winning Le Mans with Sauber, Indy with Penske and the Monaco Grand Prix with McLaren. Those are the great classic events." Working directly under Hubbert, Norbert Haug emphasized that the care and feeding of the partnerships was a key element of his job. 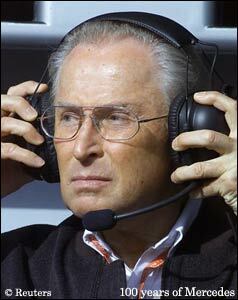 He was not a Neubauer, he stressed, out in front of the pits with stopwatches controlling the teams. Rather he worked behind the scenes to secure and protect the relationships with the Mercedes-Benz partners: "They must have the right working conditions. You can't expect top performance when they don't have top conditions. They need to be able to concentrate on their work." The partners came through. Sauber did his job in the 1980s with the rebirth of the Silver Arrows in Group C. AMG achieved excellent results in the all-important German market with its C-Class racers. And with Ilmor, Penske and McLaren as partners, Mercedes-Benz won the Indy 500 in 1994, and in 1998 and '99 again scaled the heights of the Formula One sport that it had once dominated. Only in the late 1980s did Mercedes-Benz renew the strong motor sports commitment that it suspended after its dominant year of 1955. For three decades, apart from some rallying with standard cars, its great racing reputation was neglected. In both the human and technical senses it was difficult to bridge the gap. But the spirit never died. Determined and enthusiastic people kept it alive. When it was necessary in their view for the welfare of the firm they 'did good and spoke not of it'. The gap was bridged. And when it came time to make a return, suitable partners were ready too. The partners knew this was no sinecure. They too needed to perform 'up to Mercedes-Benz standards'. Many knew the legend; some knew the history. Daimler-Benz had faced and mastered virtually every challenge that the world of motor sports had to offer. Was this to be a burden to them, or a benefit? The results on the track gave the answer. In the past, Mercedes-Benz raced against Fiat, Sunbeam, Lancia, Peugeot, Alfa Romeo, Auto Union, Bugatti, Ferrari, Bentley, BMW, Porsche, Maserati and Jaguar - to name only the greatest of the many great marques that matched their speed and endurance with the cars and engines from Mannheim and Stuttgart. In the 1990s it continued to compete with many of these and added strong and able new rivals: Renault, Ford, Opel, Honda, Toyota, Audi and Yamaha. Since the end of the 19th Century, Daimler, Benz, Mercedes, Daimler-Benz and Mercedes-Benz have raced for their customers, for their country, for prestige, for their traditions, for sales, for exports and for fun. Mercedes-Benz never seriously attempted to justify its racing activities by making claims that they were of direct benefit to its production models (although they often were). defeat." This could and should remain the watchword of Mercedes-Benz in motor sports. The skill and intuition of its managers, researchers, designers and engineers gave the assurance that the racing cars and the passenger cars bearing the Mercedes-Benz name were built to a very high standard that both had in common. This was the intellect of the company, its rationality. Racing was the soul of Daimler-Benz, its emotion. Both intellect and emotion are needed to bring to completeness not only a person but also an organization. At the beginning of the new millennium Daimler-Benz - now DaimlerChrysler - was again complete.